Urban Cycling Part I: Does Biking To Work Make You More or Less Likely to Die? 5Boro Bike Riders crossing the summit of the Queensboro aka 59th Street aka “Feelin Groovy” Bridge. For some reason the significant other of the skeptical cardiologist (SOSC) has decided to stop here to look at her cell phone, thereby creating a traffic hazard. 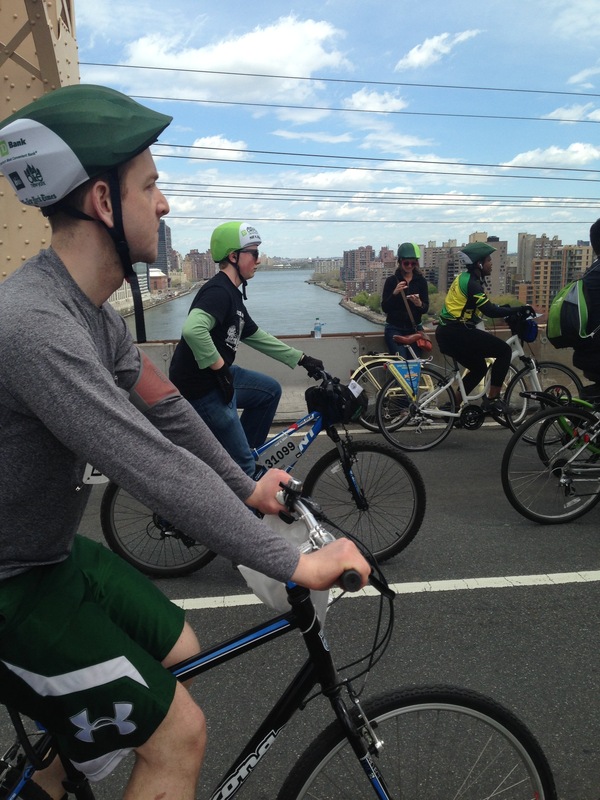 The skeptical cardiologist recently participated in the 5 Boro New York City Bike Tour. It was quite cool. Unlike my previous rides in Brooklyn and Manhattan (under the guidance of legendary Park Slope flaneur, NYC biking advocate, and old high school chum David Alquist) I was not in constant peril from automobile encounters because we cyclists had the mean streets of New York all to ourselves. Take a look at this video to understand “why cyclists come from around the world for an experience of the Big Apple unlike any other”. The NYC event, and the fact that this is “bike to work week,” lead me to ponder aspects of urban bike riding, specifically, cycling as transportation. Since cycling is physical exercise and there is scientific evidence (observational studies only) linking regular physical activity to a significant cardiovascular risk reduction, we might expect that it would help us live longer. A reasonable physical activity goal , endorsed by most authorities, is to engage in moderate-intensity aerobic physical activity for a minimum of 30 min on 5 days each week or vigorous-intensity aerobic activity for a minimum of 20 min on 3 days each week. This level of exercise helps with weight control, fitness and is associated with lower mortality from cardiovascular disease . 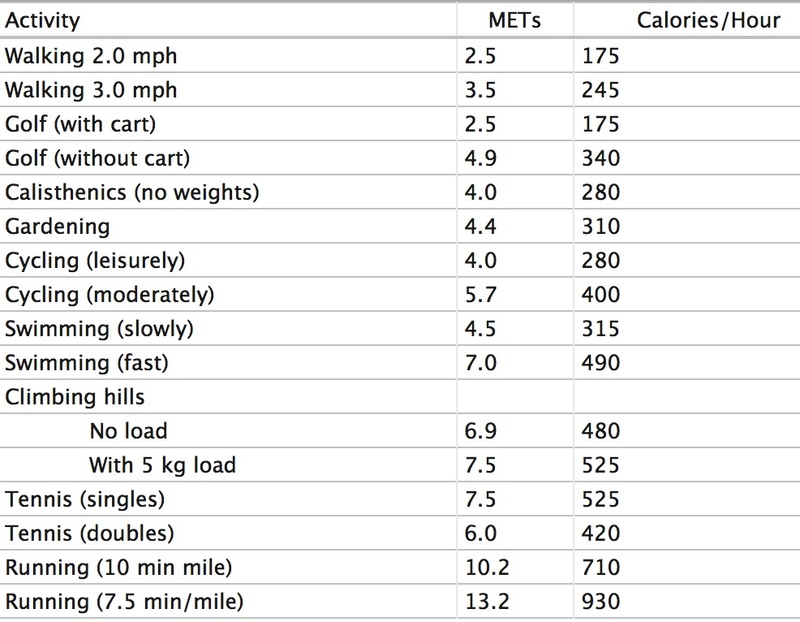 The metabolic equivalent of task (MET) is a measure of the energy cost of physical activity. The chart to the left gives METs for various activities. Individuals should be aiming for 500–1,000 MET min/week. Leisure cycling or cycling to work (15 km/hr) has a MET value of 4 and is characterized as a moderate activity A person shifting from car to bicycle for a daily short distance of 7.5 km would meet the minimum recommendation (7.5 km at 15 km/hr = 30 min) for physical activity in 5 days (4 MET × 30 min × 5 days = 600 MET min/week). Thus, cycling to work for many individuals would provide the daiy physical activity that is recommended for cardiovascular benefits. However, cycling in general, and urban cycling in particular, carries a significant risk of trauma and death from accidents and possibly greater exposure to urban pollutants. 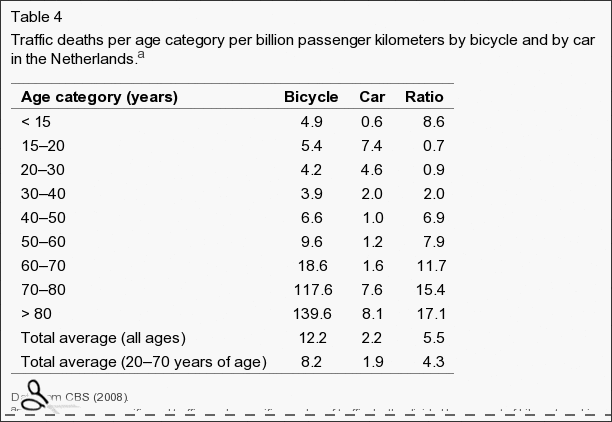 This table shows the estimated numbers of traffic deaths per age category per billion passenger kilometers traveled by bicycle and by car (driver and passenger) in the Netherlands for 2008. These data suggest that there are about 5.5 times more traffic deaths per kilometer traveled by bicycle than by car for all ages. Interestingly, there is no increase in risk for individuals aged 15-30 years. On the other hand , those of us in the “baby-boomer” generation (?slowed reflexes, poor eyesight, impaired hearing) and older are at an 8 to 17 fold increase risk. In the Netherlands, where a very large percentage of the population regularly rides bikes, there has been considerable scientific study of the overall health consequences of biking and we have reasonably good data on the question of relative safety of biking versus driving a car for short distances. You can watch the happy people of Groningen (“the world’s cycling city”, where 57% of the journeys in the city are made by bicycle) riding their bikes below. For individuals who shift from car to bicycle, we estimated that beneficial effects of increased physical activity are substantially larger (3–14 months gained) than the potential mortality effect of increased inhaled air pollution doses (0.8–40 days lost) and the increase in traffic accidents (5–9 days lost). Societal benefits are even larger because of a modest reduction in air pollution and greenhouse gas emissions and traffic accidents. When traffic accident calculations for the United Kingdom were utilized, where the risk of dying per 100 million km for a cyclist is about 2.5 times higher, the overall benefits of cycling were still 7 times larger than the risks. If you decide to bike to work this week, braving the elements , the possible automobile collisions and the automobile exhaust you can rest comfortably with the thought that not only are you prolonging your own life but by reducing greenhouse gas emissions and air pollution you are contributing to the health of everyone around you.